As our time in Portugal is wrapping up and we are preparing to head to Spain…I am reflecting on our time spent in this beautiful country. Needless to say I have absolutely loved Portugal, honestly I don’t see how you couldn’t. It is filled with wonderful people, breathtaking countryside, fantastically old cities, rich history, inexpensive vinho and tasty food. With that being said, each place we visited in Portugal was unique and different. 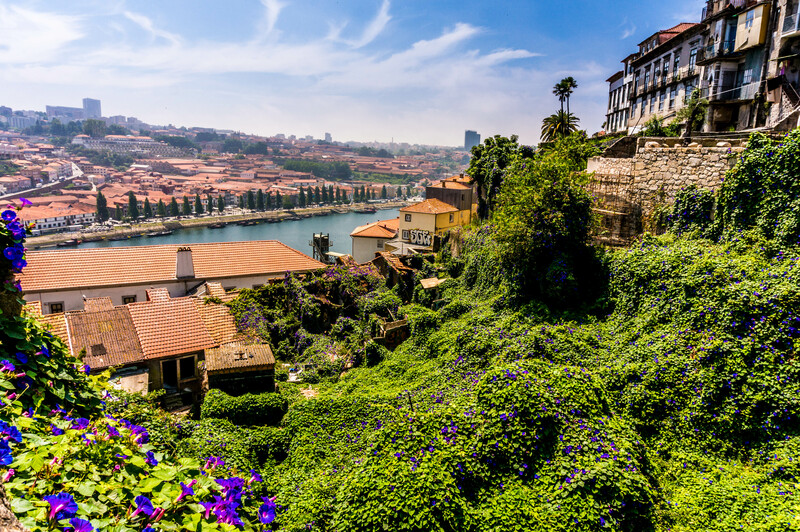 The things that I will remember most about Porto, are not necessarily the city itself but the people that we met and our visit to the Douro Valley. We arrived in Porto on a very overcast, rainy Saturday evening. The city was dead or so it felt like it to me. My first feelings where that the city had similar architecture to Lisbon, but it appeared a bit rundown and dirty. Although my feelings didn’t change much during our stay in Porto, the city did seem to brighten up and come alive when the sun came out, especially down by the river. The Dom Luis bridge which extends across the Douro River and connects Porto with Vila Nova de Gaia provided a beautiful backdrop for lunch near the water. And we enjoyed a nice stroll along the river looking up at the colorful tile faced buildings. We also spent a good amount of our time in Porto in the hostel, planning and hanging out with new friends. Despite some minor faults, such as no air conditioning or fans, cold showers and a lofted, creaky bed, the hostel we stayed at was a great experience. During the school year, the hostel is occupied by international students that attend a university in Porto. Therefore, the atmosphere is very homey and welcoming. There was a large common area, a fully equipped kitchen and a great patio. We very quickly made friends with people from Germany, Belgium, Holland, France and Australia. We shared wine, learned about each others countries and just hung out. We even planned a dinner one evening. I made the appetizers, then one of the guys from Germany who is a cook made a delicious salad and grilled steak (Wes’ loved it) and then we had amazing fruit and yogurt for dessert. It reminded me of our neighborhood dinners in Oklahoma City with our very best friends. 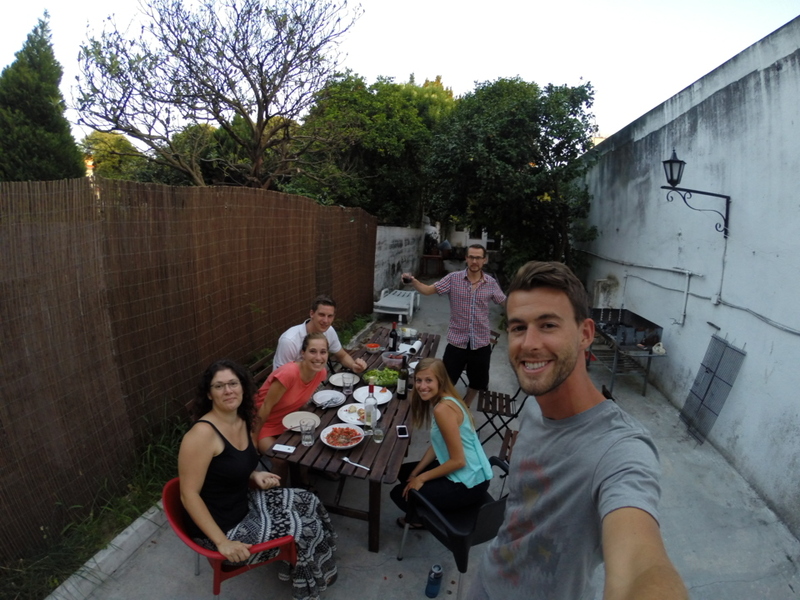 I loved getting the chance to cook and share food with new friends! I guess it doesn’t matter where I am in the world, I love doing a version of the same thing. Although we stayed up late drinking and eating with our new friends, we managed to hop on the Linha do Douro (the Douro train) early the next morning. The train ride along the Douro River was absolutely the highlight of my time in northern Portugal. I only wish we had planned to hop off the train in one of the tiny towns and stay at least for a few days. Unfortunately, our plans to stay in the Douro Valley had fallen through, so we turned it into a day trip. We took the early morning train and got off in the port producing town, called Pinhao. We walked across a small bridge and visited a tasting room for one of the wineries. Then we stumbled upon a five star hotel and both decided that we just wanted to relax, drink wine and enjoy the view. 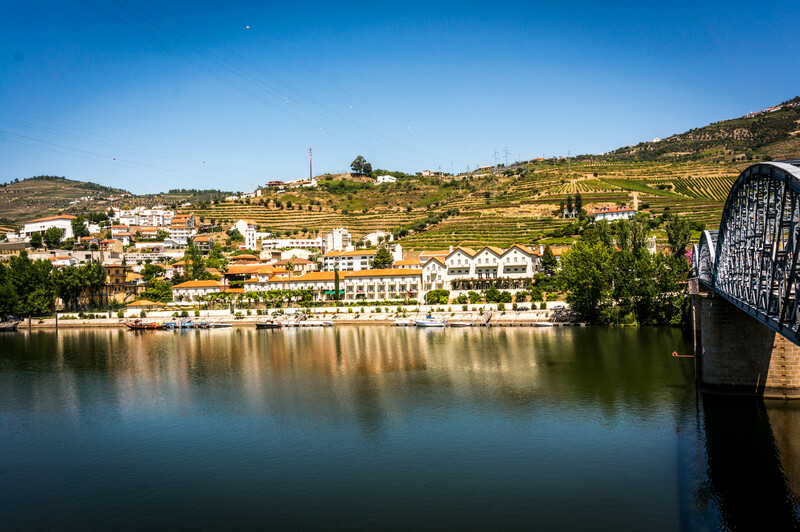 We sat on the patio at the CS Vintage House Hotel, looking over the Douro River and enjoyed a glass of wine, delicious potato chips and ice cream. If you are planning a visit to the Douro Valley, I would recommend at least stopping by this beautiful restaurant for a glass of wine. After our relaxing afternoon, we hopped back on the train and finished our ride down the rest of the Douro River to Pochino. We were not able to get off the train to explore the area around Pochino because we had to head back to Porto (3 hours more on the train). It was a lot of time on the train for one day, but it was 100% worth it to me. 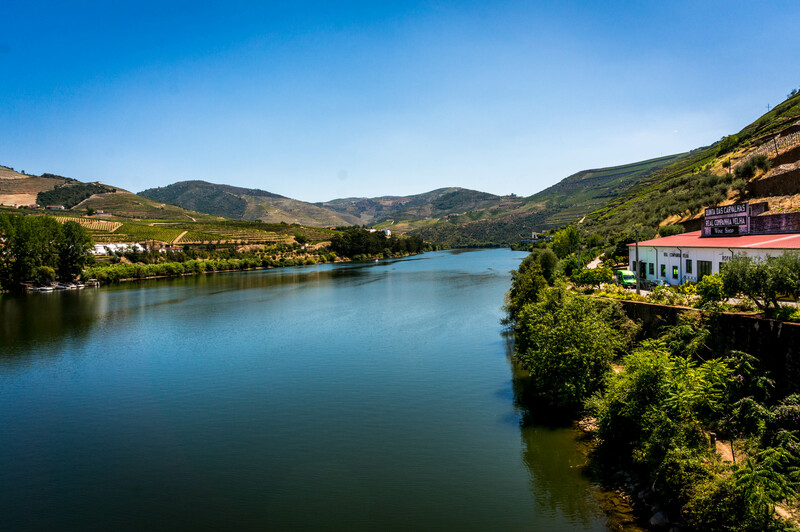 The Douro Valley is unlike anything I have seen before, grapes cover essentially every piece of hillside and red roofed homes are nestled in between the never ending vineyards. The river winds through the valley creating an ever changing picture. 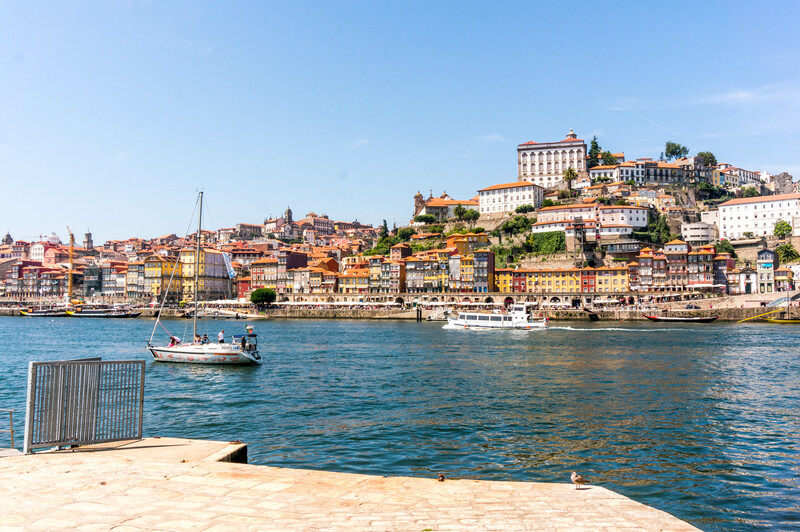 Although I don’t expect to make a special trip back to visit Porto, I do plan to visit the Douro Valley again…and I think that you should to! Although Portugal was not on out Top 10 List, after reading your blogs and viewing your pictures, I think Nancy and I need to get over there in the next few years. However, I think we will skip the hostels, and stay in hotels. Have fun in Spain! I love hearing about your travels. You inspired me to pick up some Douro Valley wine.